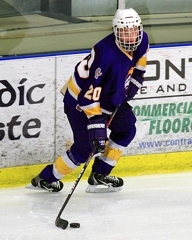 With his team holding a 1-0 lead midway through the second period on Tuesday night, Cloquet sophomore forward Westin Michaud suddenly found the puck on his stick with a lot of room to skate. To make things better, he saw his brother, Beau, whizzing up ice with him. At that point, Westin understood exactly how the sequence of events would conclude. Michaud was right; that’s exactly how it went. 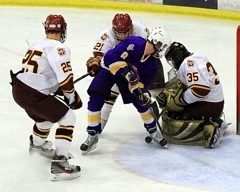 Westin wheeled into the Duluth Denfeld zone, slowed to get the defenseman to commit and served Beau a textbook cross-crease pass. 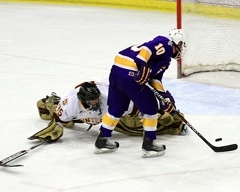 Beau finished it off by depositing the puck into the yawning net to give Cloquet a 2-0 lead. The pretty passing and eventual goal was just one of a handful of beautifully executed productions from the Lumberjacks’ top unit, where the Michaud brothers work with super sophomore Karson Kuhlman. For the night, the trio racked up two goals, five points and so much cycling time in the offensive zone that the grooves from their skate blades almost reached the concrete floor below the rink. Not only did they own the offensive side of the game, but they also were key on defense. They transitioned quickly, got sticks in passing and shooting lanes and backchecked their you-know-what’s off. The reason for the group’s constant success is pretty simple according to Michaud; they are three pieces that fit together flawlessly. The self-proclaimed playmaker does have 18 goals, but as Michaud says, those will come with the work he puts in, especially when he’s grouped with his brother and Kuhlman. Four different Cloquet/Esko/Carlton players scored, while John Scheuer made 25 saves to lead the Lumberjacks to a 4-2 Lake Superior Conference win over Duluth Denfeld on Tuesday, Jan. 31, at the Heritage Sports Center in Duluth. 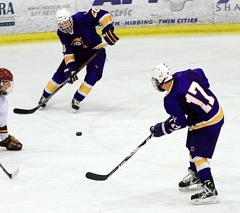 Adam Hanson and Ryan Lind each recorded key goals for Cloquet. Hanson scored on a breakaway in the first period to open the scoring, and Lind added a goal from a tight angle late in the game to seal the victory. Even with the contributions from the second and third lines, it was clear that the Lumberjacks’ top unit was the difference tonight. 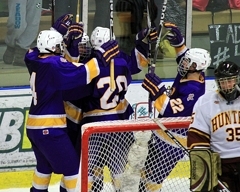 Beau and Westin Michaud, along with Karson Kuhlman, chipped in two goals and five points on the night to put Cloquet over the top. Beau Michaud scored the Jacks’ second goal of the contest off a perfect setup from his brother, Westin. After picking up a loose puck at center, Westin skated in, pulled up and found Beau on the doorstep for a tap-in tally with just over 10 minutes gone in the middle period. Then, just five minutes later, the brothers again connected for a goal, this time setting up Kuhlman for a giant marker with time running down in the second. Levi Talarico and Jordan Buetow scored the Duluth Denfeld goals, both coming in the third period to make it a close game. In the end, Scheuer and the Cloquet defense stood tall to secure the victory. Drew Dincau and Kellin Lamirande each had single assists for the Lumberjacks (16-6-0). Scheuer was his usual self between the pipes, and he made several big saves on odd-man rushes and Denfeld chances from just outside his crease. Brendan Johnson and Nick Thompson were the only other Hunters to get a point (single assists each), and Zach Thompson finished with 23 saves in net. 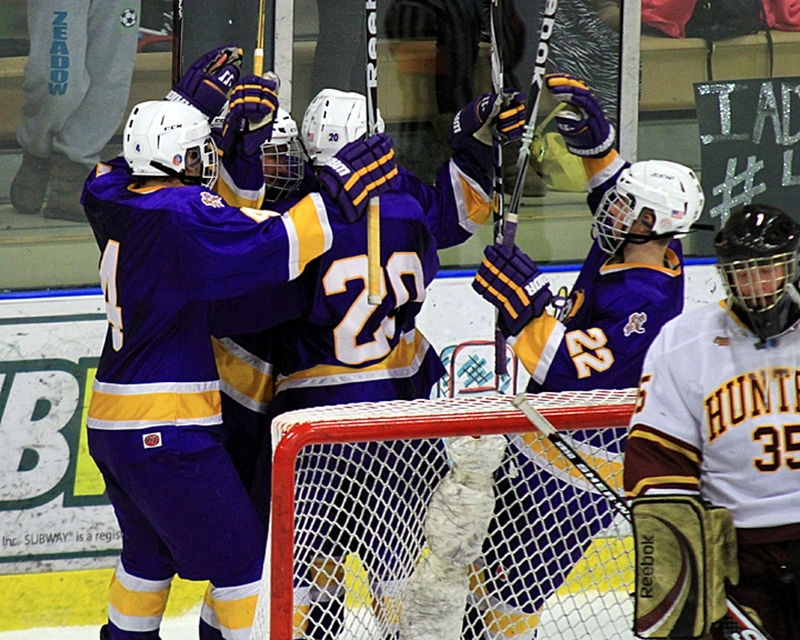 Cloquet will be back at home on Thursday to host Class 1A’s top-ranked team, Hermantown. Duluth Denfeld (9-9-2) continues a tough stretch of the schedule with a crosstown rivalry game against Duluth Marshall on Thursday night. The younger of the two Michaud brothers made perfect passes on two second-period Lumberjack goals to help build a 3-0 lead for CEC in the middle period, and was an offensive pest all night. 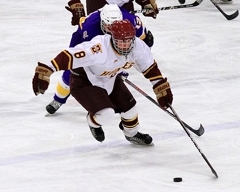 With his speed, Michaud blew around Duluth Denfeld players, beat them to loose pucks and helped the Lumberjacks’ top line control the game every time they stepped on the rink. 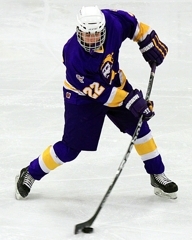 Much like his younger brother, Beau is able to use his speed to create offensive looks for Cloquet. On Tuesday, Beau scored on a perfect setup from Westin, and then collected another point with a helper on Karson Kuhlman’s tally late in the second period. Michaud also chipped in on special teams, making some big plays on penalty kills to hold the Hunters off the board. Scheuer has been a rock in net all year, and he played yet another terrific game on Tuesday night. Despite giving up two third-period goals, Scheuer made some stellar saves in the first and second, allowing the Lumberjacks to build what proved to be an insurmountable 3-0 lead. Then, with the game on the line late in the contest, Scheuer was calm and cool on his way to a handful of stops in the closing seconds.